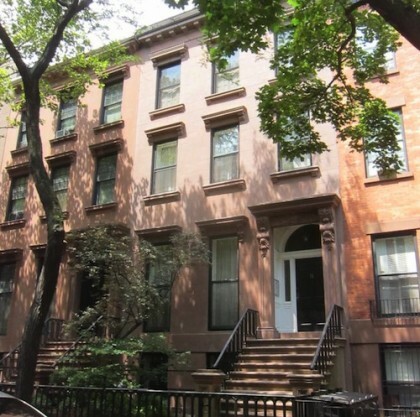 Yet another Brooklyn Heights residential property has joined the $5 million-plus club. The three-story townhouse at 13 Monroe Place was just recorded in public records with a sold price tag of $7,750,000, according to Brownstoner. Joan Goldberg with Brown Harris Stevens appears to have brokered the deal; there is no public listing for the property, meaning it was likely a private showing-only prop. Cops To Brooklyn Heights: Don’t Be Daft… Lock Your Front Door! But according to Gerry and Newshound..this part of the heights is dumpy…you guys really nailed that one! Monroe Place is crummy I would not live on that block. Yeah, the area around Henry Street and those horrible brown high rises that look like Red Hook projects are dumpy. Monroe Place is pretty nice until you get to Clark Street,then it looks pretty dumpy too. This was the building where the entire front lintel and doorway area crashed to the ground a few years ago, while the occupants were in church. It took out big chunks of the steps and the front iron railing. Completely rebuilt, of course, since. The only thing dumpy about BH are Gerry’s posts. Not enough rats like on Montague Terrace Gerry? Gerry likes to live amongst his own kind. @ Andrew Porter – that was 101 Clark Street that had collapsed owned by Barry and Este Brahver. @ h – there are sections of Brooklyn Heights that some feel are better than others. We live in prime Brooklyn Heights others live on dark crummy Monroe Place that seems to have more dog poop on the sidewalk than other streets.. Henry Street has pockets of dumpyness here and there. We can live anywhere in Brooklyn Heights that we like I love our home with skyline views from my front door I feel exhiliarated early each morning as I leave for the day. And I like to chat with the tourists. This is a great section of Brooklyn Heights. Gerry, 101 Clark didn’t collapse. It was evacuated because it looked like something was about to go very wrong. Wait, Gerry are you talking about the building at the corner of Clark & Monroe? That’s the one which became dilapidated for lack of maintenance and was then evacuated. Gerry, I will bet you $1,000 that the front of 13 Monroe Place was damaged several years ago when the entranceway collapsed onto the stairway. The fact that 101 Clark Street also collapsed is an extraneous fact. I also post under my name, but you use a pseudonym. We’ll let Homer go into the archives and see who’s right. What we’ve been calling 101 Clark is on the South side of Clark, so must be an even address: 100 Clark, a.k.a. 1 Monroe Place. @ Andrew Porter – no i do not want to make a bet i do not gamble I work too hard for my money to risk the loss of $1K. Maybe it had been 10 Clark St? The ugly black rundown building in the crummy dumpy part of Brooklyn Heights had on the corner of Clark St and Monroe Place owned by Barry Brahver and it had been a ramshackle slum. On our prime Brooklyn Heights block we have no such slum type building. My name is NOT a pseudonym it is Gerald I am called Gerry and I leave OUT my last name due to security measures at work and at home. And 101 Clark is across the street from the building that collapsed. And as you can tell by my name, I like Monroe Place and Orange St! Not that sales price means everything, but I think 99.9% people in the world would be happy to live on a crummy slum block containing $7.5 million houses. @ Cranberry Beret, you’re absolutely right. I’m one of those 99.9% people that would be exceptionally happy to live on ANY “crummy slum block” in Brooklyn Heights. hmm overpriced or spectacular inside? lol wonder when someone will take out the abandoned building on the corner if this is what the raw space is worth these days.